​Chronicling America, the newspaper collection available for online research of United States historic newspapers, regularly updates their collection. Here are the updated titles for February, 2018. Some are new titles and some are added to an existing title's pages in the database. There are 35 in total from 9 different states. (Please note that some newspapers may be listed multiple times because they were updated more than once by the Library of Congress during the month). How do you search the site and find "stuff"
This post is all about the second part - how do you download and save materials. "Make sure you plan ahead before you download an article." Many of these sites use different underlying base software and they all are quite different in their approach to providing a download capability. Use a software snipping tool such as the Windows "Snipping Tool" or some commercial offerings, such as SnagIt, Shutter, Jing, etc. There are many of these tools. So you just snip the article with this tool. The newspaper library software will snip the article for you and present it as a "whole" article. The concern with all of these methods is "How do you end up with a complete article that is large enough to read or is zoomable?" "Zoomability" is one of the biggest complaints that I hear from my fellow online historical newspaper researchers after they download an article. ​So, depending on the capabilities provided by the site software, make sure that if you do NOT want to download the article with the highlighted text, that you download the article the way that you want it. There is always a way to get the article without the highlights. You can experiment with the software or just download the page that has your article and crop it later. So just like your need to concern yourself with downloading highlighted text, you will need to be careful with downloading articles that are broken up, as in the examples. It is always safest to download the article (or entire page) in .pdf format and crop to your liking later. With .pdf formats you can generally zoom to the size you desire and then crop or snip the article in one piece. The Article is Too Small - this is the challenge that requires the most forethought when saving the article for later use. Much of the time, the repository software will allow you to download or snip articles in several different ways. Unfortunately, if you do not check your downloaded image before you leave the site, you might be disappointed in the size or the quality of said download. Make sure that it is either zoomable after the download or if not, that the article is zoomed to a readable size prior to downloading. Also, if it is too small when downloaded, depending on how the site prepares the clipping, zooming later may degrade the quality so that when zoomed, it is so fuzzy that you can't read it. Just like the other challenges, forethought will lead to the best results. It is always safest to download the article (or entire page) in .pdf format and crop to your liking later. With .pdf formats you can generally zoom to the size you desire and then crop or snip the article in one piece. In this example. the left image shows you the name of the newspaper and date of publication. In order to obtain more details, the link "View Description" when clicked will yield the image on the right, which contains much more information. What I do is include the publication title, publication date and page number as part of the file name of the downloaded .pdf or image file. The moral of the story is that online newspaper collections can be an incredibly valuable tool for you family history and genealogy research. Fortunately, much of what is written above and the challenges presented are not huge to overcome. Just think ahead and make sure that the articles that you download are readable and in a format and size that pleases you and your future readers. And make sure you document where the articles came from! OK - before you bite my head off - the title is not implying that "Cousin Bait" CAN'T work - it is just posing that there are many reasons why it "DOESN'T work. I have had great success finding "cousins" of the 2nd, 3rd, 4th variety as well as those removed once or twice. BUT that was after I started thinking about what I was doing and made a few mistakes along the way. So here's seven of the reasons that it doesn't work - it is not an exhaustive list by any means but it is indeed some of the primary ones. Overcome the deficiencies and mistakes on this list and you will have a much better chance to find those elusive cousins, ancestors, photos, stories, documents, etc. It certainly is well worth the effort - family history research is certainly more rewarding and fun when you have multiple genealogy "buddies" in your family. You don't get alerted to blog comments by email - OK, I may be the only one in history who screwed up big time by not setting up new blog comments to be emailed to me. My most important cousin (actually 3rd cousin) tried to find me for 6 months after placing a comment on my Marksology blog in 2009. I never saw the comment because I had not set up the blog to alert me when I received a comment. I wasn't even hip to "cousin bait" at that time - I was just trying to document my ancestors stories online. Without her, a whole critical branch of my tree would not have been found and immense joy would have been missed. So make sure that your comment alerts are set up properly so that most critical new cousin can connect with you. You do not have any way to contact you on your site - I have visited many many family history websites where there is no About page, no Contact page, and in some cases no name or photo of the author or an email address to contact them. So, if a prospective cousin lands on your site and is all excited about finding a possible connection - how are they going to reach out to you? Your site is so boring that no one wants to contact you - So pretend you are a new researcher and you think via a search engine of some kind that you have found a new cousin connection. You click on the link and with great anticipation you bring up their site or blog in your browser. You can't wait to see what is written. You begin to read the site and this is what you find - A dissertation listing only names and BMD dates. Throughout the site are a bunch of spelling errors and typos. There are no stories at all about the individuals mentioned. The grammar is terrible and the entire piece is poorly written. The layout of the site is awful and you have a hard time finding the "meat" of each article. Are you inspired to contact this person? You don't include locations AND names AND dates especially if your ancestor has a common name. Locations can refine the search performed by the prospective cousin. A very fine post about the details that are essential can be found in Amy Coffin's post about Cousin Bait. I personally do not write SPECIFIC cousin bait posts, since my family history sites are intended as an homage to my ancestors and a way to document their lives. Hence EVERY post can be construed as "cousin bait" and Google's search algorithms help me achieve that automatically. Your forum entries may be stale and lonely - I have used rootsweb and ancestry.com forums and have had success once - but it was a HUGE connection - and she was my very first cousin connection - actually a second cousin who i had met over 50 years prior. The problem that I find with some forum use is that we post and forget. That is not a bad thing because sometimes you may get a response several years later - if the forum automatically emails you; and if your email address hasn't changed. I have some forum entries that are over 10 years old and my email address HAS changed. Furthermore, in reviewing some of the questions that I posted way back then - I have garnered new information that I should add to the forum, or possibly augment the entry itself. Your One World Tree entries aren't paying off - Full disclosure, I am not a big fan of the OWT concept, yet I have posted the details of my deceased relatives/ancestors on Ancestry Family Tree, My Heritage, and WikiTree. There are others, like Geni and FamilySearch for example. The only one that has "paid off" for me is Ancestry's, several times. The others - zero. And yes - I do have sources included and my trees are not copies of anyone else's. The bottom line with these is that you must have sources included because any researcher with some experience will likely skip over non-sourced trees. Just like forums, OWTs are a crap shoot. Your "cousins" just do not care - News Flash - not everyone has the passion to find out about their ancestors and family history; in fact many just do not care at all - period. And there is nothing that you can do to "convert" them to the Church of Genealogy. Here's another News Flash - once you make the initial connection with a new cousin they may be interested for one day and then never or very rarely again. And all the begging and pleading to get them to share their "goodies" won't help. I wrote an article about this in November, 2012 - No More Begging the Cousins. Check that out. So there you have it - please re-visit your cousin hunting strategies and maybe you can get your cousin bait to work better. Because it CAN and will work with the proper attention, motivation, and tactics. In a recent article, I wrote about about why you should create a Family History Website. The main reasons are to document for your living relatives and other readers the stories, photos and events of your ancestors lives; and to be used as a tool to "cousin hunt" - that is to find new relatives that may assist you in filling out your family tree, add new ancestor stories, and to assist in identifying those pesky old photos with all the unknown people in them. To achieve these goals it is critical for the site to be attractive and to have meaningful content that allows the reader to hang out at your site and absorb information. Furthermore, it may entice those relatives that are not prone to sharing, to actually do so, thereby enhancing the quality and quantity of your content. So let's discuss what are the important elements of a Family History Website and why they are important. Almost all Family History Websites are set up as blogs. This enables the writer to concentrate on one person, or one sub-family, or a particular event to create a story. These stories obviously must be well-written and the length of the story is up to you. Many blogging experts will tell you that they need to be 800 or 1,000 words - but the length needs to fit your style. If you have a story that is best told in 400 words - do not stretch it to 1,000 words just because some expert says so - the reader may get bored because of repetition in the story for example. Even though you are writing a non-fiction story - use fiction techniques. The worst thing that you can do is start your story like the following: "Eva McGillicudy was born on August 4, 1833 in Chicago, Illinois, the daughter of James and Sarah." Who wants to read a story that starts like that? Even though dates and location research is a large part of family history research, just spitting out this information and focusing on this information in your story is in a word - BORING. An interesting occupation, or a patent or discovery by your ancestor. Some of these occupations may indeed be "frowned upon" such as prostitution or rum running. The most important thing to a memorable family story is to have fun with writing it - be funny - use sarcasm - make it interesting to your readers. No website in my opinion is attractive unless it has photos or other images. What brings a Family History Website alive are the photos of your ancestors - with their diverse wardrobes, their interesting hair-dos on women and facial hair on men. You must have photos on your site. 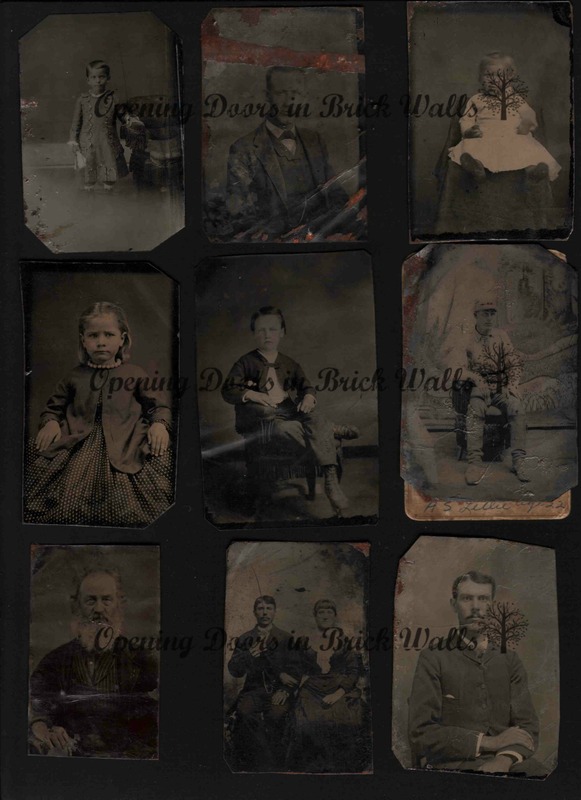 The following are some examples of the presentation of photos in a family history site. Some of the photo galleries are hosted within the site and some take the reader outside the site to commonly available photo album storage sites, such as Flickr, Google Photos, Photobucket, etc. All of them have pros and cons. The following link is a comparison of some of these sites. Comparing the best ways to store your photos online - Find out which photo-sharing and storage site best suits your needs with this deep dive into the top online photo services. The links below are some actual examples of photo presentation in family history websites. ​Family Album - In this example the author included a link in his family history website to an online photo album housed by Google Photos. With all the documents that a family history researcher accumulates - why not put the non-sensitive ones on your site or make them available to your readers? One should never place birth or death certificates online for example because of their sensitivity and their inclusion of Social Security numbers. But why not make available census records, or immigration and naturalization records? Or you may have special collections. In the example below the author has created an "Artifacts" tab and you will see the authors presentation of the aforementioned documents, and also special passports and other artifacts. Again - the more information that you can make available to your readers in an attractive way, the more successful the site. No matter where you look for old newspaper articles, it all comes down to planning WHERE and WHEN. If you search original newsprint in an archive, microfilm in a library, or an online collection - these are the two most important criteria to consider first. This article is not a list of what online sites you should search. This is about determining the locations where your ancestors MAY have an article written about them. Then you can determine where to search, whether online or in an archive or library. So how do you know where to find your ancestors in newspapers? And what date ranges do you use as part of your search? The answers may seem obvious but they are not. So let's examine what you need to consider to find the locations where these articles await. The most obvious question is "Where have they lived?" From various documents and records that you have collected, either BMD information, city directories, census records, etc., you can establish what their cities of residence were. At the bottom of this article we will show where to find newspapers for those cities. If your target lived near the state border, check out neighboring state newspapers. For example, if they lived in Council Bluffs, Iowa, check out the Omaha, Nebraska papers. Or if they lived in Camden, New Jersey, try the Philadelphia newspapers. Unique human interest articles were copied all over the country and world. One of my ancestors was given Geronimo's knife in the 1880's in California and the article was published in papers in Pennsylvania, Virginia, Indiana and London, England as a human interest story. Don't just search for articles for the dates that the ancestor was alive. Often, newspapers had a column that featured stories from 10 years ago, 25 years ago, etc. and your ancestor might be mentioned in that column. Furthermore, if your ancestor was well known in the community, he or she might be referred to in an article a few years after their death. This is tricky if your ancestor has a common name and date ranges are important to narrowing the number of search results. When searching for obituaries, include a couple of weeks after the death of the ancestor. Many times the obituary publication was delayed, but more importantly, some obituaries were changed after their original publication because of errors, modifications, or additions. So don't just stop searching after you have found the first one. Furthermore, try searching a few days or weeks before the ancestors' death. They might have been in an accident, or were ill for some time and that information may have warranted an article in the newspaper. Regarding obituaries, don't just limit your search to the location of the ancestors death. Many times the obituary is copied (and possibly altered) in newspapers in the area where your ancestor had lived previously. I have several examples of this in my family. Once you have determined the cities and date ranges of interest, you can search the database from the Library of Congress, that provides detailed title information for over 150,000 newspaper titles published in the United States. More importantly, it offers the holdings information for each of these newspapers - whether in archives, libraries or other institutions. For access to online collections, I would encourage you to review the Newspaper Research Links page on this website, where links to over 20,000 newspapers are presented. Finding articles is an exercise of narrowing and expanding, combining dates and locations as part of your search plan. It is tricky and requires persistence. It is definitely an art rather than a science, in my opinion. What struck me in writing that piece, as well as the comments that I received, was that a lot of folks are, in my opinion, much too focused on dates and documenting dates, and sources of those dates. For me, I am interested in assuring to as much a degree as possible, through research that Great Uncle Isaac was indeed married to Great Aunt Carrie. And it is useful to know that they were married on July 26, 1887 and that he died on June 7, 1931, both events occurring in San Francisco, California. That's nice, but I am more interested in knowing why he left the family business to be a stage electrician for the California and Columbia Theaters and other prominent San Francisco theaters in the 1900's. And why of the four brothers who were the sons of Louis and Caroline Marks, he was the only one who had a stable life, and didn't go to prison, or desert his wife. Again, my opinion - dates don't cut it for me. If this pursuit was all about dates, I would quit in a heartbeat. So what I try and do is to write the stories of my ancestors, from sources such as verbal family stories (and rumors from time to time), newspaper articles, photos, documents, letters, etc. EVERYONE OF THESE HAD A STORY AND THEY DESERVE TO BE REMEMBERED, AND IF WE DON'T WRITE THEIR STORIES - WHO WILL? I am going to repeat myself - if we don't write it - who will? If you post the stories on the Internet, you might find a "cousin"
You may inspire some of your known relatives to participate and share more stories and photos and documents than they already have (if they have). Did I say it is fun? I am more of a "spitter of words." And sometimes it comes out OK and sometimes it doesn't. But you know what - I don't care. And I suspect that at this juncture, my ancestors don't care either. Now I do know of a couple of folks in the family history world who are much better writers than myself, and who actually have a plan, and have written about the writing of family history. I encourage you to read the materials on their sites. They are very helpful. The first, Lynn Palermo, is the author of the site The Armchair Genealogist You can find on her site numerous articles about writing your family history. She has actually published her families history - I suggest you review her many helpful articles. The second is Caroline Pointer, whose suggestions regarding family history writing revolve around a family history blog that you might create, and how to write the blog posts (stories) that will inhabit your site. Her family history writing site is Blogging Genealogy. So sports fans, write a story or two, or twenty, or a hundred. It doesn't matter where you write it or how you publish it, but I guarantee that you will have fun doing it and you will feel good about keeping the memories of your ancestors alive. Dear Relative - Why Won't You Share? Okay - I admit that researching my family history is by and large a selfish activity. Starting this pursuit with no plan and no direction - I began because I wanted to discover MY family history, not the guy's down the street, not my dentist's and certainly not for relatives I had never met. To be honest, once I got into it - a bit of altruism did creep in. This started to occur once I realized that the recently departed most certainly would have known who the people were in the old photos that they left behind. How would I ever identify the old guy with the funny beard, or the lady with the bustle? No one was around to help. So I vowed that my descendants and their cousins and their children would be able to know who their ancestors were and that nothing and no one was going to stop me. But I needed assistance - that's for sure. When I started and did not even know the first and last names of 6 of my 8 great grandparents - how was I going to do this without help? So I began to interview my closest older living relatives - of which there were only three. That got me a little ways - and new surnames were uncovered and through these interviews and hundreds of hours of online searches - a picture started to emerge. I got well past identifying my 6 unknown great grandparents and their parents and in some cases, their grandparents. And stories started to be found and even some old photos were shared and identified. And in these online searches, I started to find what I fondly called - the STRAGGLERS. You know who these people are - the ones that you KNOW in your heart and in your gut are related - but you can't prove it. And a few years go by and you still can't prove it. But it got real fun when I started a family history website and remote cousins started to contact me. And I hit the jackpot. Several 2nd and 3rd cousins appeared to me and the pieces started to fit, and even most of the stragglers were identified. And guess what - some of hem had photos - lots of photos - and lots of other artifacts - like German letters, and marriage certificates, and a few death certificates and many other documents. And we started online photo albums and a few of us shared photos with one another and tried our best to identify them. And we identified the living descendants of many ancestors and had what I call a "representative" of each of these ancestors - all who were born between 1870 and 1914. And to a person - these representatives were excited to have found "cousins" who they didn't know even existed. And hundreds of emails flowed back and forth - discussing dates and maiden names and what they remembered. And then came the fun part - SHARING. And some did share, and some did not. Are you a Hoarder or a Sharer? Oh there were a few who shared every single piece of paper, every document, every photo. They scanned them and emailed them, not only to me but to others in our growing extended family - trying to find someone to identify the woman with the bustle and the man with the funny beard. And we were somewhat successful, but some of them decided to not share. They talked about the metal box they had with all of their grandmother's records and letters, or the three boxes in the garage that they had to get to someday, or my favorite - "I scanned everything I had" (when I knew that they had more). And then there were those who sent three crappy photos of their mother, when I knew that they had many many others. So my message to you hoarders is "people die and unfortunately you may be one of them." And sooner than later (hopefully not for your sake). But guess what - when you do, all your knowledge dies with you - and your children and grandchildren will never know that the guy with the funny beard was your grandfather - and the woman with the bustle was his second wife, and they may never know that the woman who you thought was your grandmother wasn't and you never knew who your biological grandmother was. And that is because you kept all these materials and artifacts to yourself, and that by sharing, many of us could have helped YOU know who your ancestors were - because they overlapped with ours. And then your children and grandchildren would know too. This article is advice for me - just as it is for you. Trust me - I fall into this trap more times than I can count. Genealogy and family history research has changed so much in the last 20 to 25 years. In the "old days" one needed to demonstrate a ton of patience - for example, waiting for documents to come in the mail; planning a trip to a library or archive; visiting some place where microfilm could be researched; or waiting for letters from newly found "cousins." In an odd way it was easier then because one could plan their research much better. And planning could definitely be more easily included in one's research. But today - we have a bunch of resources at our fingertips via the Internet, forums, databases from commercial and free entities, digitized records and indexes, online newspapers - you name it. Even online courses and webinars. Despite these riches it s incredibly easy to be distracted by the next shiny thing. I see some folks spending more time viewing webinars than researching. And checking out the latest genealogy app for their smartphone or tablet. How many times have you gone to ancestry.com or FamilySearch for example just on a whim and entered the same old search criteria for a surname that you have searched dozens of times before? Heck - it's easy - just try it again. Isn't that the definition of insanity? Trying the same thing over and over again expecting a different result? Sure there may be a new collection available that you aren't aware of - but it is in many cases wasted effort. The solution is focus and discipline. I admit that discipline is not my strong suit. But I can focus. How about you? Develop research plans for individuals and/or collections. This is the best suggestion. Don't be subscribed continually to online databases. Take a 6 month break from one of them. Focus on others. if you can afford all or most of them go for it. But many can't, yet they still stay continually subscribed. I took a break from ancestry.com for a couple of 6 month periods and used other online resources instead, or worked on offline research. And I didn't suffer total withdrawal. I do the same thing with online newspaper databases - I take a few month break from time to time. Work on photos and stories for a month and ignore the BMD hunt. Those dead people will still be there and their "dates' will not have changed. Plan a sources and citations month. As with many or most we have data in our genealogy databases without sources cited sufficiently. Spend a month just focused on cleaning some of those up. Choose another month for connecting and re-connecting with your "cousins." Many times they disappear because they aren't as interested as us and just won't go into that attic or garage to pull out the documents and photos that they have. Re-connect and see if they can be hooked this time. Don't get off track by all the automatic hints that many sites provide for us. If we have our family trees on ancestry.com or My Heritage or others we often get emails or indications that there are hints or matches for us to review. Totally cool, but often wasted time reviewing all of them (especially when the match is from a person who has copied your work!). It is easy to be bombarded with all of these online resources that are readily available. And as we all know, there are many more records available that are not online. But if we spend all of our time flitting from one online site to another, how will we make the time to research offline? The best analogy that I can think of is Alice down the rabbit hole. The world of online resources provides a ton of riches, yet can actually impede some of your research if you let it.